At this time of year we commonly examine the year that has past to assess whether we have achieved our goals or lived-up to our previous expectations. This is also the time of year where many of us make new year resolutions in an attempt to improve ourselves in the coming year. The Wheel of Fortune card shows the constellations of Aquarius, Scorpio, Taurus and Leo – the four fixed signs of the Zodiac. They tell us that the heavens are open to us, fortune is here. We could use this time to change our fortunes, to make things work for us in the coming year. Instead of just empty words when we make our new year resolutions, we now have the opportunity to put some thought into what it is that we would like to attract into our lives or change in our lives so that the year ahead meets us pregnant with possibilities for improvement. In the centre of the card is a large wheel. Upon the wheel is inscribed the Tetragrammaton, the four Hebrew letters that form the sacred – unpronounceable - name of God. This card therefore further prompts us to use the inspiration of a higher power to generate something useful in the year ahead. As we contemplate our new year resolutions we could tap into the power of the Source for inspiration and divine guidance. 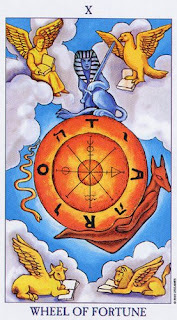 The alchemical symbols that are shown on The Wheel of Fortune card are water, sulphur, salt and mercury. Alchemists combine elements together to achieve certain results. These with the Zodiacal energies present on the card remind us that the energy is here, and that we should use it mindfully as we enter the new year. 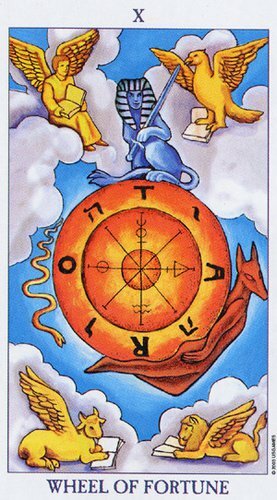 Just as the alchemist combines elements to achieve certain results we also have the Sphinx represented on the card which in-itself is a coming-together of different forms to create a whole new one, like the lion body and human head combined to create something new. We should take this opportunity as we stand on the cusp of the new year to use the available energies so that we too can create something new. This card tells us today that everything we need is already in place, all we need to do now is to make it happen. Let us not procrastinate any longer, the snake depicted on the left-hand side of the wheel represents our darker nature sliding downward, let us strive to become the ascending figure on the right of the wheel instead as it moves upward to greet its fortune.